There’s more to mini than meets the eye. The new iPad mini 4 puts uncompromising performance and potential in your hand. It’s thinner and lighter than ever before, yet powerful enough to help you take your ideas even further. iPad mini 4 puts everything you love about iPad into an incredibly sleek and portable design. So you can watch your favourite programmes, play amazing games, enjoy FaceTime calls with friends or get work done, wherever and whenever you want. iPad mini 4 is powered by an A8 chip with second-generation 64-bit desktop-class architecture. Whether you’re browsing your photos, editing a video or giving a presentation, your experience will be smooth and seamless. The iSight camera in iPad mini 4 delivers advanced optics, an improved sensor and an Apple-designed image signal processor. It also includes handy features like panorama, time-lapse video, slo-mo, and burst and timer modes. The front-facing HD camera has been redesigned too, with a refined sensor and larger pixels for even better low-light performance. The upshot? All your photos and videos — and video calls and selfies — look incredibly vivid. iPad mini 4 uses breakthrough Touch ID technology to turn your fingerprint into the perfect unforgettable password. So you can unlock your device with just one touch and keep your personal data secure, even if you share your iPad with someone else. Touch ID also lets you make secure purchases in iTunes, iBooks and the App Store. And with Apple Pay, you can make purchases within your favourite participating apps quickly, conveniently and securely. easier than ever to connect quickly in over 90 countries and territories. 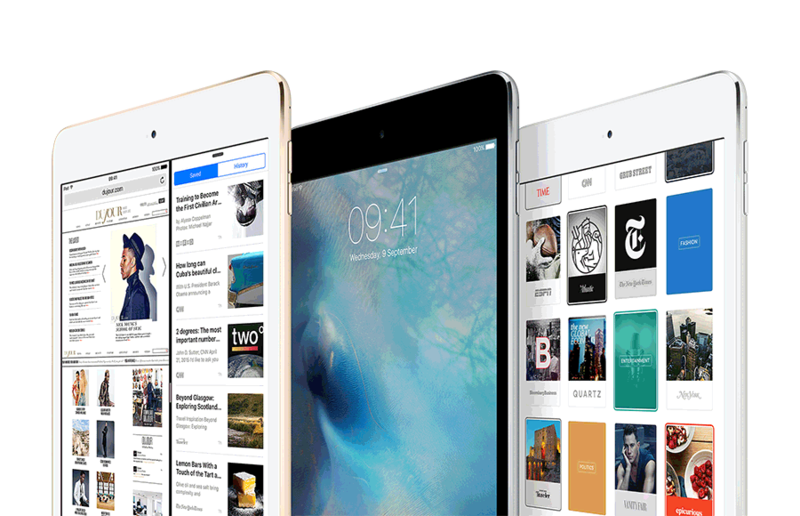 iPad mini 4 runs iOS 9, an advanced and secure mobile operating system. And with improved built-in apps and multitasking features like Slide Over, Split View and Picture in Picture, iOS 9 helps you get more done in powerful yet simple ways. Whether you’re researching on the web while writing a book report or creating a presentation while on a FaceTime call with a co-worker, you’ll get more out of your iPad than ever before. iPad mini 4 comes with powerful built-in apps for the things you do every day, like surfing the web, checking email, editing movies and photos, writing reports, and reading books. And there are hundreds of thousands of apps in the App Store designed to take advantage of its Retina display (instead of simply stretching out iPhone apps). So whether it’s photography, gaming, travelling or managing your finances, you’ll find an app that will help you do it better. Covers made for iPad mini 4. Colours that match everything else. The iPad mini 4 Smart Cover and Silicone Case protect your device everywhere you take it. Designed to be paired, the Smart Cover attaches to the front of your device while the Silicone Case snaps onto the back. Together, they provide all-around protection that’s available in 10 gorgeous colours. quickly and easily share your documents and files with people nearby. No setup required. iPad mini 4 and iOS 9 are engineered to work seamlessly together, creating a great user experience in an environment that’s designed to be highly secure. Because iOS is engineered with such a focus on security, most of the mobile malware in the world ends up on other platforms. And we’re always working to make it even more secure. We lead the industry in delivering operating system updates as quickly as possible, and we make it easy for you to download and install updates on your iPad to take advantage of our latest protections. services are designed to make our devices better. Plain and simple. iPad mini 4 can connect to thousands of wireless accessories — including third-party keyboards. Using AirPrint, you can print to most wireless printers. And with AirPlay and Apple TV, you can stream everything on your iPad mini 4 wirelessly to your HDTV. * Data plan required. 4G LTE is available? in selected markets and through selected carriers. Speeds are based on theoretical throughput and vary based on site conditions. For details on 4G LTE support, contact your carrier and see www.apple.com/ipad/LTE. ** iCloud requires an iCloud-enabled device. Some features require iOS 9 and OS X El Capitan. Some features require a Wi-Fi connection. Some features are not available in all countries. Access to some services is limited to 10 devices. Some features may not be available in all countries or all areas. Click here to see complete list. Content not available in all countries. Title availability is subject to change. TM and © 2015 Apple Inc. All rights reserved.